Call the Midwife meets Dr Barnardo’s in this gritty drama that will appeal to fans of Nadine Dorries and Kitty Neale. When there is nowhere else to turn, St Saviour’s will give them hope… It’s 1947 and London’s East End is still a bombed-out landscape. Sister Beatrice, who runs the St Saviour’s Children’s Home, knows that life is still a precarious existence for many children and it seems that there is no end to the constant stream of waifs and strays who appear at their door looking for a safe haven.One such arrival is Mary Ellen whose mother is gravely ill. 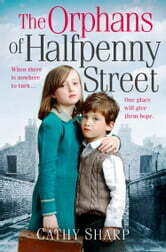 The one silver lining is her best friend, the tearaway Billy Baggins, also a resident of the home, but Billy seems intent on falling foul of Sister Beatrice’s strict regime.New arrival on the staff, Angela, admires Sister Beatrice, but can see that the children need love and kindness as well as a strong hand. When an unwelcome face from Billy’s past arrives on the scene, things are brought to a head. Can the two women work together to keep Billy on the straight and narrow – or is it too late? Excellent read and very moving in parts. At times it moved me to tears and showed me what a hard life people had at that time. Would recommend this book to everyone who has a hard time concentrating, very easy read . Usual run-of-mill Eastend story, fairly good but very obvious story. Must admit got a bit bored half way through. To read the next one ! What a great read, full of emotions and lovable characters who felt so real I felt that I knew them all by the end of the book.